Open your electric gates, activate your alarm, control your security shutters, switch on your heater, lights or other device ...with a single FREE mobile phone call or by sending a text message. When was the last time you went out without your mobile phone? If it's always with you, why not increase its uses to add moreconvenience to your life. 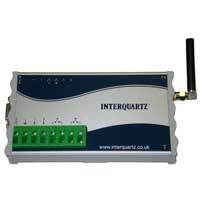 Interquartz GSM Key allows your phone to do just that. GSM Key will activate an electrical device with a call from your mobile phone. This doesn't cost you anything, because GSM Keydoesn't answer the call, but responds to your unique Caller ID before rejecting it. This makes it both secure and fool proof. So, alarms, driveway gates, lights, heating, security shutters and more items of choice are now controllable from wherever you and your phone happen to be. You can authorise to up to 250 mobilephones per unit, which means unlike key fobs, access cards or separate remotes, you don't need one for each user, (with the associated cost, bother and risk of loss or having it stolen), but you can add OR remove users instantly, simply, securely and cost free. With GSM Key you get more than one way control. GSM Key willmonitor your burglar alarm, fi re alarm or smoke alarm, texting you if it goes off, or progressively calling you and up to 7 other people. A truly intelligent addition to your home or business. Authorise up to 250 mobile phones to work with GSM Key. To add new users - just add their mobile number onto the SIM. Inputs 1 and 2 can monitor the state of an electrical circuit. When either circuit is activated, the GSM Key will send an SMS message to all of the nominated 'ALARM' contacts saved on its SIM card. It will also progressively dial each ALARM contact until one answers. The inputs can be used, for example, to monitor burglar alarms, fire alarms or smoke detectors.